My grandmothers were coming to me in signs. We could not think of a better voice to shine the spotlight on International Women's Day than Veronica Giraldo's and her grandmothers who come to her in signs. The artwork accompanying Veronica's Howling Into Evening is a fragment of Song to the Virgin by Santa Barraza. 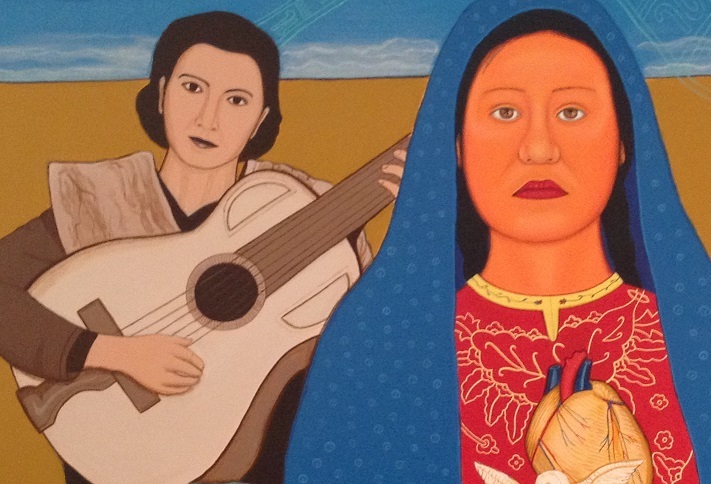 Song to the Virgin is part of the Arte y Traducion de La Frontera: The U.S.-Mexico Borderlands in the Works of Santa Barraza and Carmern Lomas Garza exhibit by the Texas A&M University - San Antonio Educational and Cultural Center on display through May 24, 1915. San Antonio is also the birthplace and home of Veronica's abuela...also named Santa. It was fate to come here at this place. It really paves the way for me to want to go out more. I was fortunate enough to have seen this excellent place with my friends. The event rooms for rent feel warm and intimate.